It has been a year since I posted Is High Intensity Training Best for Ectomorphs? Time for a follow-up. In the past year, I have scaled down my intensity. As I mentioned in a recent post, the limiting factor for my level of intensity is gym temperature. So for the most part, my environment has played the greatest factor in my lowering intensity. In the post I did last year, I assumed because I was an ectomorph that I was genetically predisposed to benefit from higher volume, as ectomorphs tend to have more slow twitch muscle fibers. That assumption was rocked when I got my test results back from 23andMe. 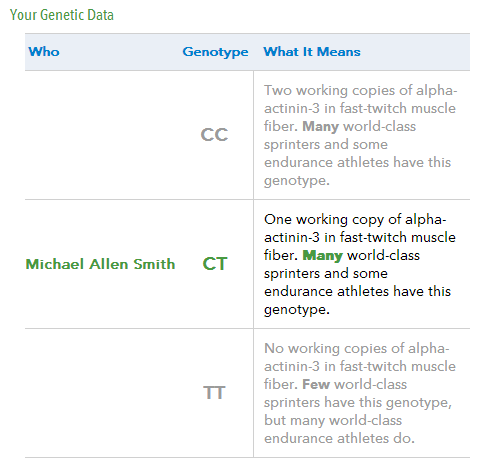 The book Body By Science talks about the alpha-actinin-3 gene and how those trainers who lack that marker could be modest intensity responders. Meaning that high intensity might not be best for them. They tend to be built for endurance. And unless I misread everything, they tend to be ectomorphs. Since last August, I assumed I was in this camp and have reduced my intensity. Well, maybe it is time to turn back up the intensity, because I have one copy of the alpha-actinin-3 gene! Did not see that one coming. It is really hard to know if I would have had a better or worse year had I pursued higher intensity and lower volume. As I mentioned in the post earlier this week, I probably under estimated the amount of volume I was capable of doing once I lowered my intensity. I think it is sad that so much focus is directed upon specific workout routines. Focusing on reps, sets, weights is likely the least important factor in fitness. Know your genetics. Either through confident observation or a test from 23andMe. Safety first. Ignore the bravado nonsense of other fitness “professionals”. Avoiding injuries is the #1 thing you can do to improve your physique. Getting sucked into thinking you need the follow the extreme exercise routines of outliers is a losing strategy for all but a handful. Recovery. Let your body recover before returning to the gym. We, ectomorphs, tend to over train because we lack patience. We over analysis. We can’t sit still. We return to the gym before we are ready and when that doesn’t work, we do more. Relax. Stop competing with the genetically (and sometimes chemically) gifted young mesomorphs. I suspect the least important part of the equation is the volume and intensity tradeoff. Cycle both. Listen to your body. What workouts keep you interested? What works for you might be different than me. And it will change over time. Assuming you’ve nailed down the first 3 items, there should be a multitude of paths available to strength and muscle gains. I also have this same genotype. And was confused as to what would be the best way to train since it is the in-b/w one and not the either/or. I’m not an ectomorph though.. and actually I’ve been confused by what “morph” I truly am. When I was growing up until about age 23 I seemed to be a mesomorph. Now I look like an endomorph. Very confusing.. can that change? Does a mesomorph who is extremely sedentary and gains quite a bit of weight just look like an endomorph, but still be a meso? Anyways, not that important. When I was younger I was a dancer. My body seemed to respond easily to those types of workouts (ie. dance/pilate/yoga), but I also was just “naturally” thin and fit growing up so it’s hard to say what truly worked or not. @Erica – Somatype is a spectrum. You might be a meso-endomorph. Also, I don’t know much about applying this to women, as the variance in muscular potential is far greater in men. Think of the difference between a club bouncer and a lanky cyclist. They might be the same height, but the bouncer might have 50-100 pounds more muscle. I don’t think that variability exists with the ladies. Agreed, the difference is there somewhat, but not nearly as noticeable in women. I was only going by the pictures I’ve seen for somatypes for women. I haven’t looked much further into it really. As for the exercise… I think it will matter in a similar way for women. As muscle type is muscle type no matter your gender. Of course women won’t be as large in building muscle, but I would think the alpha-actinin-3 gene would still make a difference. I am curious as to what percentage of women actually have the CC type though. Because in my experience growing up I was naturally was more athletic than most all of the girls in school with me when it came to anything that required muscle strength. I also beat most of the boys in strength things, like pull-ups for example, until we got older of course. This is completely just speculation of course, but I’m wondering if maybe it’s more common for women to be TT? Regardless, I do think that maybe training for your genotype is actually best no matter your gender. Another great and insightful post about your training. I definitely agree with the last three recommendations you made at the end of the piece. I’m not so sure about number one. I know personally, that if I had a handle onmy genetics, and what it meant for my training, then I would automatically shut myself off from any potential to discover different avenues of sane and safe training. I, and maybe others may do routines that we thought worked, at the expense of others that may interest us. I was always of the mind that this fitness stuff was a voyage of discovery. Now, in respect to my current knowledge, at least I feel like I have a bit of a map to help me, unlike years gone by, but I still have to do some of the navigating myself. If knowing my genetics, provided me with a big neon signpost, then where would be the fun in that? @StuartG – I see your point, but it works both ways. A year ago, I revisited minor details in Body By Science and came away thinking I wasn’t a best responder to high intensity. Then I got the 23andMe and was pleasantly surprised. Without the test, I would have assumed I was a TT. So it helped my discovery. @Carlo – Thanks for sharing. I could be up for eating a bowl full of cherries a few times a week. (So is Michael Johnson, who still holds the 400m record). Useful comments about the risks of over-training – thanks. @Glenn – I don’t consider those 3 typical ectomorphs. Dr. Darden states the greatest predictor of muscle potential is having minimal distance between the end of the bicep and the elbow. When I look at these 3, I see tight spaces, which is not typical for ectomorphs. It is a mesomorphic or even endormorphic characteristic. Lewis appears (hard to tell) to have the same benefit. I’m not convinced. Of course this is all anecdotal evidence. We’d ideally need precise measurements of a large sample. What may be observed in those three sprinters is simply typical west African somatic typology. @Glenn – To be clear, where the bicep meets the muscle is not a measure of muscle, but muscle potential. Dr. Darden I believe came up with his formulas after training hundreds if not over 1,000 athletes over decades. So I don’t consider it anecdotal evidence. Of course there will be outliers. Finding a jacked ectomorph is rare. Finding a jacked ectomorph with a large space between the bicep and elbow is extremely rare. I’m an ectomorph with a 2+ inch gap. It took me a long to “get it”, but I’m OK that I’ll never be jacked. Yes, OK – I think we’re talking at cross purposes. I’m not interested in being jacked. Like those sprinters, I’m interested in being fast. I think Christophe Lemaitre proves that an ectomorph can be very fast. I see your point too. Knowing your genetic potential would enable you to plan a trainining program which emphasizes success and minimizes the pitfalls. In that sense, it would be enjoyable, because success and progress bring their own enjoyment. This post from facebook highlights your point of view. Aerobic exercise is good for you – at least if it’s not performed excessively or by people with the “wrong” Apo-E type (determines the way your body deals with cholesterol). If you belong to the poor carriers of the E4 (actually it’s epsilon 4) type, however, your postprandial lipid levels won’t benefit from exercise at all. * If you carry the E2 variant, moderate exercise is for you. * If you carry the E3 allele, you respond more favorable to intense exercise. However, what about those who discover via gene testing that they are non responders? How would that affect their mindset going into an exercise program? I feel for many it wouldn’t be an incentive. The other thing that concerns me about the advances in genetic testing, is the Pandora’s box it opens. For every individual like yourself, that utilizes it for legitimate means, there would probably be ten others who would use it to gain an edge, think Lance Armstrong, Tyson Gay, A Rod etc. How long before we progress into gene splicing, designer babies etc, if it is not already here? That is the next undetectable evolution from today’s drug taking culture. Think of your typical gym rat, looking to get an edge over the guy on the bench next to him, coupled with your overreaching pushy parents. Who knows what kind of society we’d live in once the procedures became affordable to the masses. As good as science has been, the scary implications of this, make me sometimes hanker for an age of innocence. It’s my understanding that there are many factors which determine an individuals potential speed. I should imagine where your body type fits on the spectrum of things is one of the least important. Muscle length, would be less important than percentage of muscle fibre type, where the muscle attaches to the limb, and limb length. Relative strength, would also be important. I’m pretty sure, that compared to the average man or woman most of the very large, (veering towards the meso- endomorphic type ) field athletes ( javelin, shot and discus ) could put in a pretty fast sprint time. Even the 270lb+ NFL linemen would be seen as fast against an average man or woman. Michael therefore may be hampered by the fact that he has an average potential for strength, indicated by some of the factors listed above, coupled with limb lengths ( ectomorphic in nature ) that are not conducive to DEMONSTRATING strength in the gym. The best bench pressers in the world have barrel chests and short arms, where as the best javelin throwers have much longer arms, which help them to create speed for the throw, both are tests of strength. @Glenn – All my posts are about getting stronger. None are about skill development. I would consider sprinting to be a mix of strength, skill and genetics. Genetics we can’t do anything about. Strength is strength and can be applied however you like. I would say that I am easily stronger than the average man my age and body type, yet I am slow. I am slow, because I don’t train that skill. Speed is the essential primal survival skill. Absolute individual strength was likely never as important. In the ancestral environment it usually would have been possible to have a friend/father/brother help lift things. 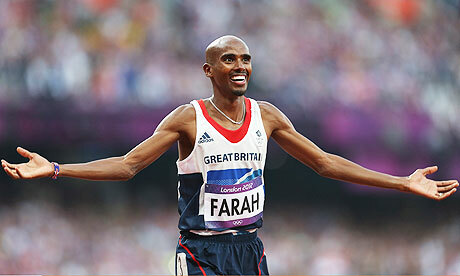 BTW – A surprising majority of world champion sprinters are the youngest of large sibling families. That has nothing to do with bone length, muscle fibers, etc. Thanks Stuart. Putting aside the issue of illegal performance enhancing drugs, my point is there is a world of difference in the overall physiognomy of a Ben Johnson versus an Usain Bolt and yet they have run very similar times in the 100m. What I mean is there is a lot more to sprinting speed than muscle and bone sizes and shapes.